The love of reading is her gift. Reserved and, according to some, a bit grumpy, Aunt Serafina had been silently waiting for retirement, and then, when the time came she packed her bags and left. When her phone call arrived, I could not believe it. «Hello Anna, I am leaving. I’m going to explore the land of Sepúlveda. I’ll send you a postcard». I had no time to make any comments, she had already hung up. The week before, I had met her in the city, at the bus stop, with her usual, slightly worn yellow fabric handbag and the inevitable book in her hand, absorbed in her reading. I had to call her several times to attract her attention. «Hello dear, wait a minute while I finish the page», she said. She had a religious respect for the characters of her books that had been keeping her company; leaving a page half read was tantamount to a betrayal: like telling a friend, «Wait, I need to talk to someone else». She listened to her books without judging them; she suffered and rejoiced in their stories: how many times had I surprised her with her eyes full of tears or intent on repressing an uncontrollable laugh! I made out the title of the book that she held in her hands: “Madame Bovary”. «How are Emma and Charles?» I asked. She lifted her head, «Have you read it?» Se asked me, excitedly. «Yes, a few years ago, on holidays. I found it …». «Stop, don’t condition me! Leave me the pleasure of discovering the story for myself». I offered her a ride home, but she refused, saying that reading on public transport was perfect: one journey crossed another and she could even afford the luxury of an extra lap of the route to finish the chapter. That was the way she was: strange. .
She never married, perhaps because of this free spirit of hers, her being unpredictable. She gave priority to virtual love over a real love, a live love, made up of odors, skin and concreteness. It depended on the paperback! At times she felt the desire for the beautiful but damned man, other times for the romantic in his tuxedo holding a rose in his hand, but her favorite was the fascinating Vladimir, with his mysterious adventures and his wanderings in the night: where was he going that night? From which neck would he draw his nectar of life? Aunt Serafina had to find out that very evening! And so, the alleged boyfriends or suitors stood waiting in the wings, while she was busy devouring one chapter after the other, in a room full of books and no TV. Even in the most optimistic of cases, those suitors did not last more than a few months. When I was a child, Mom left me with Aunt Serafina for Christmas and Easter holidays: it was my godsend! 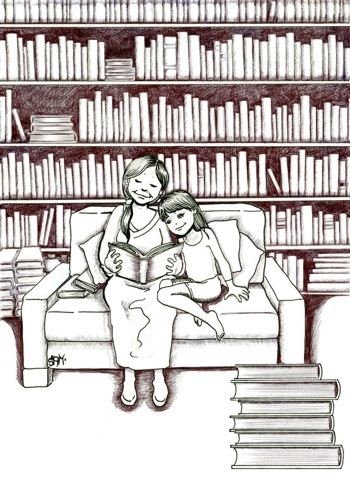 My aunt did not have the inconvenience of having to go out to work; she translated books from home, and this allowed me to be with her all day long. Her apartment was cozy and hospitable, she did not care if I dropped cookie crumbs on the floor and I could walk around barefoot. I had a small room of my own, with a foldaway bed, and shelves full of books all around the walls. In that room, I breathed the scent of adventure, an indescribable smell that sent shivers down my back. I remember my impatient desire to go into that room and rummage through the shelves, to choose the most curious titles, the oldest and yellowest books. Some were illustrated: when I was a little girl I remember flipping through them page by page, asking a thousand questions about the drawings and the characters until Aunt Serafina, exhausted from my continuous pestering, closed her book and patiently began to read me what I had chosen. The whole world emerged from those pages: ogres, fairies, elves and gnomes filled the room and dragged me into their stories, through the voice of Aunt Serafina. It seemed that the bed moved, that the big hands of an ogre grabbed me, while a fairy always came to the rescue, to free me and save my life. In the kitchen there were just a few dishes in a cupboard above the sink and a meager pantry. The dresser held books instead of cups and glasses. Aunt was just the opposite of my mother: in our house, if an epidemic were to break out, we would have had enough food to survive for at least six months. She, however, seemed to live on the books that she devoured. It was one of those books that you had to read all in one go. She put it under my nose, saying, «Doesn’t it smell good? Doesn’t it smell of adventure?! We’ll read it together after dinner». I hurriedly set the table, and she put water on the stove to boil for the pasta. We sat at the table, facing one another, waiting for the water to boil. Meanwhile, the book was there, on the tablecloth. But we could not resist it and unable to control our eagerness, we opened the book and were sucked in. Breaking away from those pages was then unthinkable. Each sentence was the prelude to the next and our curiosity became more and more obsessive. We were abducted by a world of paper, we leafed through pages that came to life, full of feelings, scentsandsounds, a succession of emotions that changed our frame of mind. I listened to her read for four hours. The water on the stove evaporated completely. «Characters cannot wait», said Aunt Serafina. «A book demands respect! Only in this way will it repay you with a growing pleasure, will it give itself to you in its entirety and reveal to you its most intimate details. A perfect match between the revealer and the listener, the giver and the receiver, a sort of love-making that goes through different stages before reaching a climax». Now I imagine her on the plane with her yellow shopping bag full of books, ready to be part of one of those gripping stories without page numbers. Aunt Serafina taught me not to deprive myself of this pleasure, to crave the silence that accompanies a good read, to fear the last lines of a book that lead to its goodbye. The next choice of book, at first, seems as though it will never live up to your hopes , but when you least expect it, you yield to the pleasure without realizing it and after a dozen pages, it grasps you, absorbs you and transports you into the story. By penetrating you, it owns you. Is this addiction? I do not know. The fact remains that I, like her, Aunt Serafina , cannot help myself. On the shelf, the key: to indulge in another adventure or not?